My first official event, did the 65 mile route and wasn’t sure if I could do it, but it was fine. There was some traffic on the road but nothing too bad – although I heard others complain that they should have closed the roads given the fee (though I didn’t find it expensive). The food stops were amazing. The first one had live classical music playing. The ride itself wasn’t terribly challenging, just long. The road quality on the final descent was pretty awful, but still fun. Whole event was pretty fun, and not competitive at all. Very nice way to spend the day. I took the 40 mile route and it’s my first time participating in the Tour of Napa Valley. Though I was skeptical of whether the event is going to take place due to the weather conditions, fortunately the tour management made it happen. I registered to this event almost 5 months before the event and I have been kept aware of all the updates via email constantly and thoroughly i.e. about the course routes, directions, safety measures in place, air quality, early check in happy hour on Saturday, t-shirts, jerseys and what not. Have never seen such an amazing follow through from the management to the registrants in any other events. In addition to this, the Silverado Trail ride was awesome with amazing scenery, friendly staff and absolutely clear/precise directions marked for all route versions. The post ride lunch and the schwags/coupons that were made available by sports basement and lot other sponsors are few other highlights of this ride. I don’t see a reason why I wouldn’t come back and participate in the event next year. Next time I am going to take the 65 miler route and bringing my friends along!! Well attended and organized event through the scenic Napa Valley. 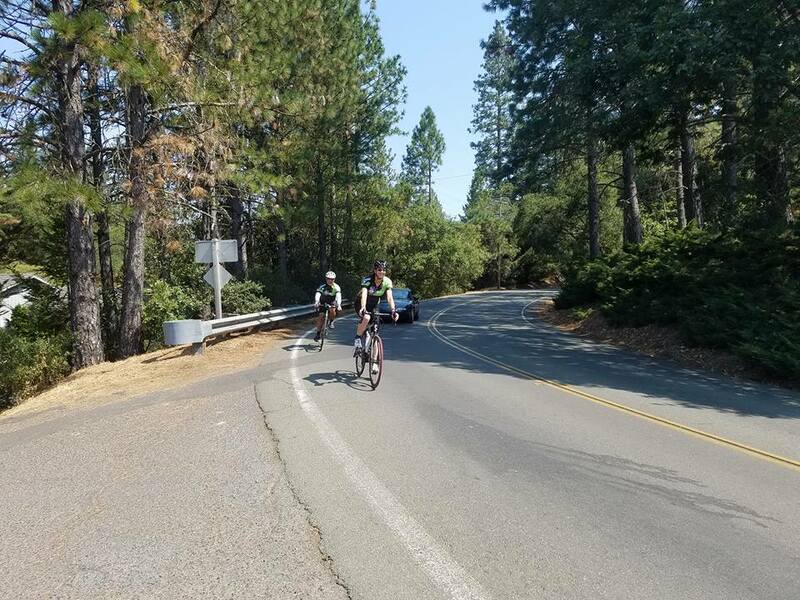 The 2018 century route went through downtown Calistoga which had a few confusing paths and slowed the ride pace. Overall it’s still a must do event on my calendar. This was my first guided ride and it was great. The weather was perfect throughout the day. 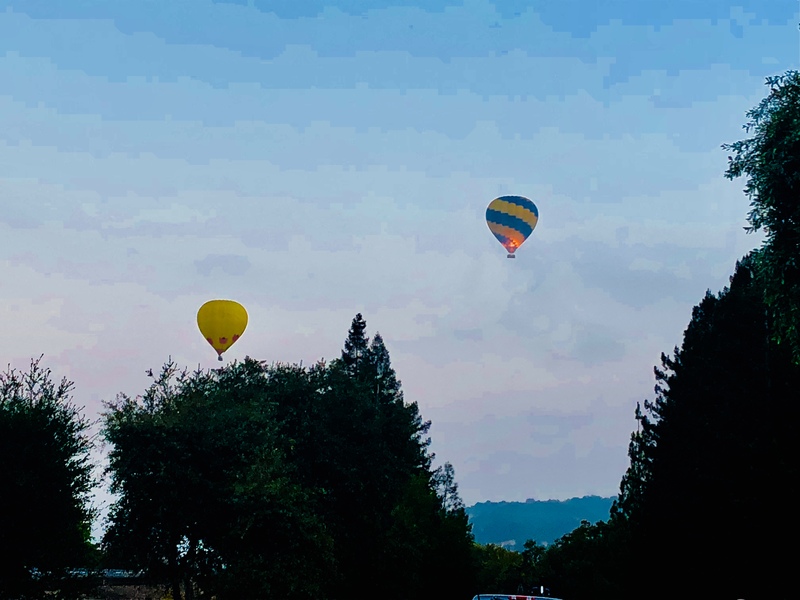 We started off in Yountville pretty early and had the hot air balloon go over head as we toured through the vineyards. After that we headed up into the hills and through the back country with beautiful scenes overlooking the reservoir, vineyards and valleys. I’m definitely going to do it again next year. I love this ride. This was my 5th time, and I plan to continue for a long time. I love Napa, and the routes are great. The people are wonderful, the after-ride party is great. The scenery is wonderful also. The road surfaces really stink – some of the worst I’ve ever experienced on any organized ride anywhere. There were some repaving improvements, but my back teeth are still rattling. This was a great ride that I really enjoyed. The jersey option was beautiful and I was so impressed with the BBQ at the end of the event. We had a great time and will be back next year doing the 65 mile ride! Best ride of the year for many reasons: The course was well marked, and well directed by volunteers as well as the CHP. We enjoyed the post race festivities, including the beer and food. The servers and staff, were very generous. We enjoyed talking to them along the way and after the ride. We could use more portapotties at the start area. And perhaps the wine was a bit expensive. But the weather was great, the course was fun, especially the timed mile, since I have never done that before. I also like having the race results, and photo available. See you next year!!!! My comment is for the Photo Crazy business that took pictures at this event. I purchased a photo and was unhappy with it once I saw the full download. Their pictures capture great detail, I’ll just leave it at that. I reached out to the staff at Photo Crazy and was given exceptional customer service. Do not have any hesitation on spending money on photos. If you are unhappy with the photo(s) they will bend over backward to alter or fix any issue within their power to do so, or offer a refund. The ride offered a variety of options for every ability. 35, 40, 65 and 100 miles. The lowest one had no climbing. The website asked too many questions and signup was a little bit of a hassle but ok. They kept us informed via e-mail beforehand (maybe a little too much 🙂 ). Parking for late comers was a little far from the start but ok. Got to get up earlier :). The registration upon arrival was a little slow. Breakfast was ok. Routes were well marked and there were helpers everywhere. Food stops were frequent and really good quality. The finish food (BBQ) was not great and it was very packed. I took the 65 mile route and streets were mostly quiet but there were some patches with fast traffic – not a lot of cars though. The roads on the 65 were really rough partially. The 35 my GF took was better streets. Hotels were a little crazy so we drove in in the morning. Overall it was a great ride and I’m happy to do it again. I rode for the first time 65 miles of Tour of Napa Valley. Very nice weather and route selection. I liked how the staff provided security at corners in Yountville which helped me a lot without losing the direction. In some places CHP helped traffic to slow down which made me comfortable. I enjoyed food/refreshment at each and every stop along the way. I really enjoyed going through winery along the way. I recommend this ride for everyone. since it is not difficult ride. This ride was very well organized. I could not partake in the early check-in and was concerned that the line on day of ride would be long, not so at all. I LOVED that the ride number was on my helmet and not pinned to my jersey. The food at the rest stops was over the top! I never once had to look at my map as the route was so well marked. All in all I think this is one of the best rides I’ve ever done. 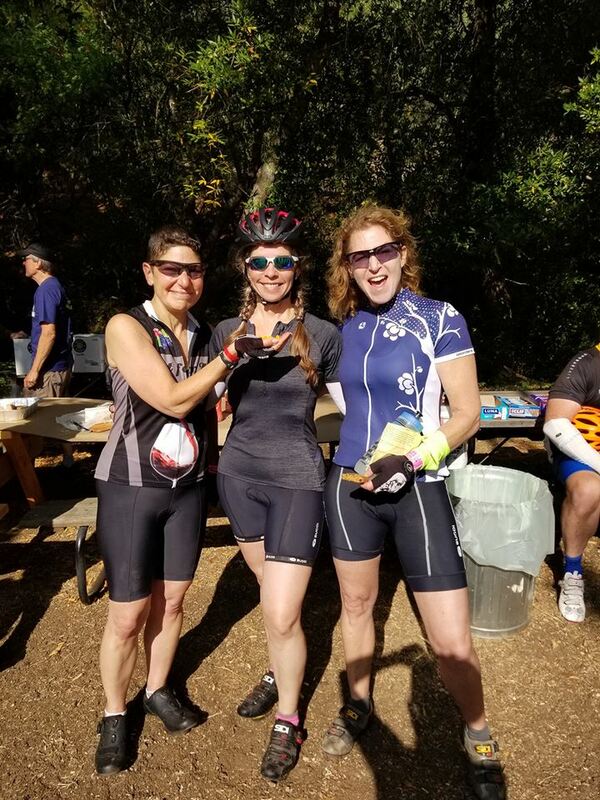 This year I rode the 35-miles route and it was relatively flat and a pleasure to ride. As usual, the staff and volunteers were helpful and very friendly. The snacks at the rest stop included great varieties and I thought they were all fantastic! The weather was nice and I particularly enjoyed the occasional cool breeze. August is such a great time to enjoy the Napa scenery with the rows of wine grapes lining the vineyards. This was my first time riding in the Napa area. I had an excellent time. The scenery and road choices were exceptional. I rode the 65 mile course and was pleasantly surprised how little car traffic there was on most of the route. The Ink Grade was not as hard as I had expected. I would recommend starting the ride early so that it is cooler when going up the grade. (Training on longer hills before the ride was a huge help.) The long downhill on the other side was a treat. The event staff was excellent. Very friendly and helpful. One of our ladies got a flat tire and the SAG team had her rolling in no time. The food at the rest stops was nutritional. (loved the fresh peaches and the Otter pops!!). We had a great time at the after party. The lunch was tasty (Ben and Jerry’s ice cream was the icing on the cake). Unfortunately they ran out of beer (not a fan of Coors-have some craft beers next time). The wine was good but $10 a glass was pricey. ($7.00 more reasonable). Our group loves to dance. The DJ was perfect. ( He played great 80’s music-our era!). We chatted with numerous cyclists along the route and enjoyed their company. This was a fabulous Northern California ride. I will be back next year for the Century. My first ever organized ride; and what a way to set my standards!. This is a very professional staff. Friendly people, great food, great wine, great party. Thanks Napa, thanks Yountville, thanks Veterans Club, thanks Eagle Cycling Club. This is a must do Tour. Pour it on!!! Rode the metric edition this year, for about six years in a row. This event has consistent quality, especially the feed at the end. It is remarkable how well the organization provides ample quantities of very fresh, healthful, appealing food served with gusto. However, the music every year is simply too loud; it prevents conversation and drives one away. Route is world-class scenery, of course. CHP and other safety seems routine and effective, although the run-in on Silverado Trail is typically a high-stress environment of tourist traffic. Beautiful scenery. Always enjoy the awesome BBQ at the finish and great music. This event is my favorite. Great ride. Staff is consistently friendly. Awesome sponsors. This year’s riding shirt was created very artfully. My hubby purchased it for me. Fabulous ride. The parking and registration were a piece of cake. Fruit and pastries awaited riders during registration and the registration staff were warm and friendly. The route was well marked and the rest stops were filled with delicious goodies and encouraging workers. Napa Valley scenery is awesome this time of year and the roads were in surprisingly good condition. The post race food was amazing with ample places to sit down and hang out with your friends to recap the ride. Overall a very well run event. I would ride this Century again in a heartbeat! I really enjoy this ride… I thought the food at the end of the ride this year (2018) was incredibly good. Beautiful fruit, fun variety of items, and the red salsa with salty chips was perfect at the end of the day. I love the Napa Valley area, so I’m admittedly biased. Rode the 40 mile/”into the hills” event with my 11 year and it was a memory I will never forget with him. Worth making the trip to this event! So this was my first organized ride. I did a century with a group and had an amazing time. Im looking forward to doing it again next year and being better prepared. There weren’t as many cars as expected which was a pleasant surprise. Staff were for the most part, courteous and friendly, with exception to the guy in charge of registration. Beautiful ride in napa valley at the perfect time of year-right before harvest! Did the 35 mile course and loved it. Mostly pretty flat. Roads have recently been improved upon! Rest stop was stocked with more food and water than I expected! End of line party was awesome with a DJ. People worked sooo hard to make this event great including standing at turns all day long! New arrows with colors made it very easy to see where to turn. Great job, I’ll be back! This review is for the 2018 metric century route. I rode the metric century last year and had a bad tire blowout because of a giant pothole on a descent between the first and second rest stops — it was good to see that specific portion of road has been repaved this year. The repaving job is hit and miss, though, so some hazardous potholes remain at other points along that stretch of road between those two rest stops. Other than that, it was a great ride this year, with fantastic cool weather for the middle of August. The scenery is always grand in wine country, and the start/finish point in Yountville is lovely. I got a better parking spot this year than last year, when I had to park down the hill from registration and it was a bit of a hike. If you park down the hill, arrange to ride your bike up to registration. The rest stops offered a nice selection of fruit, bagels, cookies, Clif Bloks, and Cytomax and water. Lunch was tasty and plentiful, with vegetarian options and ice cream for dessert. One of my favorite things about the Tour of Napa Valley is the opportunity to shower on site after the ride — it’s great to be able to clean up before a long drive home. This is a very well organized ride, there were no turns that were missing any signs even if the route was not allowing stickers on the ground. That said, the downhill stretches after ink grade and pope valley road were rough and therefore a bit dangerous. Traffic conditions in Napa were average although some cars passed us too closely for comfort. Perhaps the organizers can retool the route next time to exactly hit 100 miles because I know a lot of riders who added a few miles around Yountville Vets Homes to complete 100 miles on their Garmin. The food at the rest stops were great. They even had popsicles at the last stop. All in all this was a great experience with moderate challenges. Will definitely do it again. No schwag bag, but the delicious homemade cookies at every rest stop helped to make up for that! I did the century ride and it was pleasant. Great to get the hills out of the way in the first half of the ride. Ink Grade is pretty nice – it’s mostly shaded and that really helps. The wildfire smoke was a drag, but the ride organizers had no control over that. With only one exception, the turns were very well marked and I never even consulted my route map. The spacing of the rest stops along the century route was perfect! The CHP was located at most of the high traffic intersections/turns and that was helpful to ensure safety. This is my first group ride and was a little worried about the tour getting cancelled due to bad air quality caused by nearby fires. I am glad the event took place as planned. Tour of Napa management have kept us posted about the status through emails. Directions were spot on and parking was ample. We are provided a little breakfast with Bagels and bananas. We started our 40 Mile ride at 8:50 AM (7-9 AM slot) so the lanes were not crowded. Every turn has marking that helped us stay on course. Volunteers were present at crucial spots to guide riders and rest area facilities were great. The ride has a people of all ages and every one has been doing at their own pace. SAG vehicles were a common sight and drivers were checking with riders(taking a break) if they are OK or needed some help. Kudos to that! Heard the events has been going on for 40 years. I can see the meticulous planning and well coordinated execution that facilitates a great ride. Will definitely do the ride next year and recommend it to all my biker friends. The homemade cookies at every rest stop were fabulous! The rest stops were great – they were well-spaced along the century route and so very well stocked. Seriously, some of the best rest stops I’ve ever encountered in a century ride. The roads were pretty good, but unfortunately there’s almost no way to avoid long stretches of the Silverado Trail, which is a busy road (but at least it’s relatively wide and well-paved). Overall, it was a great ride and I really enjoyed myself – I’d do it again. This is one of my favorite centuries! Beautiful scenery, well supported and relatively safe roads. This year, I observed a greater number of CHP support – thank you! Corner marshals are a big help as always, but there was a corner or two where a little directional support from a marshal would’ve been helpful. I love the post-ride meal! BBQ chicken, pulled pork and a cornucopia of other fine food. The Ben & Kerry’s ice-cream is so refreshing after a long ride, and thank you for selling quality ale! Overall, a great ride! Hopefully, next year Mt. Veeder will be back. Overall, the ride was great. 2017 was my third year and first attempt of the 100 mile route – which actually turned out to be almost 105 miles (previously, I’ve done the 100k route). The parts of the 100 that did not share routes with the other rides were not that crowded compared to my previous experiences with the 100k. The climb up Mt Veeder was nice since it was still cool and foggy. 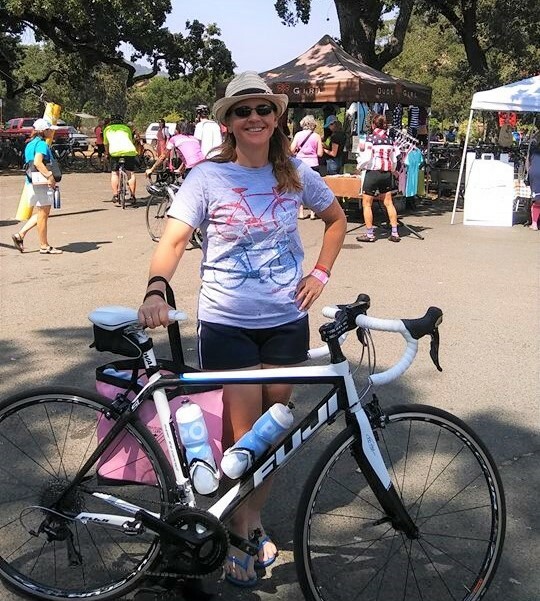 The climb out of Lake Berryessa was HOT, but still not as hot as 2015. The rest stops and final meal were decent and all of the volunteers were great. This is a MUST-DO ride for anyone in the area and one to consider for those coming from afar. Beautiful course, exceptional support, fabulous after-party and great food. Moderate pricing, easy parking and just a lovely, lovely ride. This is the third time my friend and I have taken part in the Tour of Napa Valley and its been a treat each time, especially this year when the temperatures stayed well below 90! We did the 100k, which is both scenic and challenging with the biggest climb being Ink Grade. Just when you think it’s over…it’s not, but you feel a tremendous sense of accomplishment once you reach the top. The rest stops are well-spaced and well-stocked. The event staff is super-friendly and helpful and the lunch/music after is a lot of fun. I did think this year’s after-ride lunch was a bit skimpy and not all that good, kind of a disappointment give how nice and well-stocked the rest stops were. I would like to see that improved a bit next year. Of course the Ben & Jerry’s ice cream is always appreciated! Other than that, I can’t really think of any way to improve it. Of course, the biggest treat are the spectacular views of the Napa Valley throughout the ride. Thank you and this has definitely become an annual tradition and we do plan to participate for years to come! We did the 100K on our tandem and really like the newer route. Have done this ride MANY times over the years and came back because of the route and food. While the rest stops had a wonderful abundance of food, the lunch at the end was VERY disappointing. They were out of almost everything and we had to wait for them to cook the chicken. Drink choices were minimal and they were out of beer. This was one of those rides we have always enjoyed. David Williams 2017 Tour Director. August 2017 is the third time I’ve ridden the Tour of Napa Valley, the fourth time for my husband – I had a lot of anxiety on my first ride, didn’t stay hydrated, and it was the year it was BLISTERING hot, not to mention no one REALLY warned me about the elevation climb on Ink Grade! 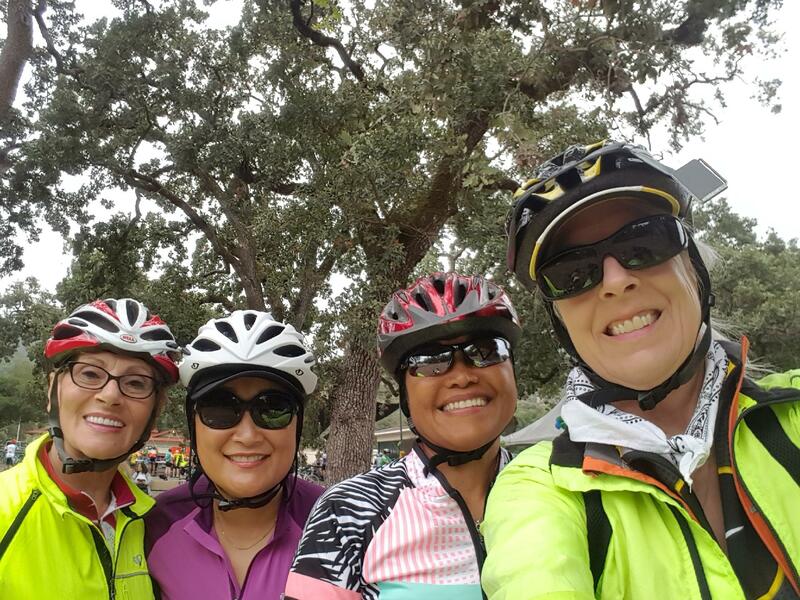 The event from start to finish, all of the setup, the people working the event from Eagle Cyclery to the SAG wagons, to the band at the BBQ were fantastic – it just got better with the second ride, and then the third ride! Thank you for marking the trails so well! I look forward to Tour of Napa Valley 2018! 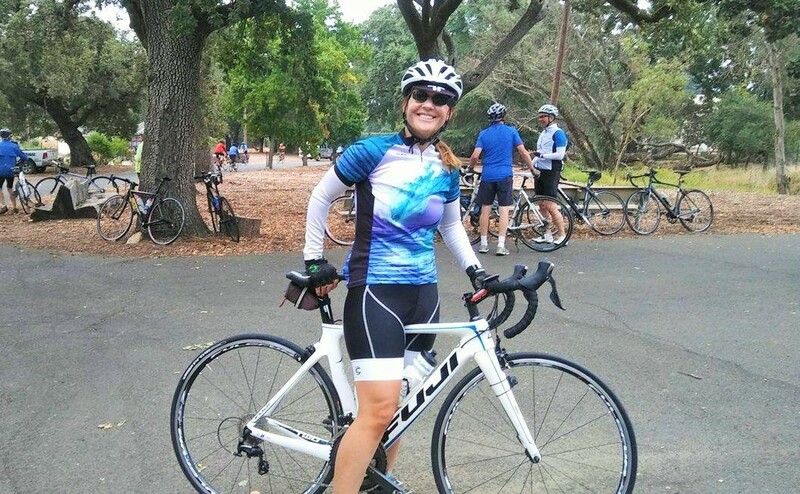 I signed up for this ride because I wanted to see the Napa Valley and what a better way than on my bike! I was not disappointed. The metric century route brought me through beautiful views of majestic wineries surrounded by massive vineyards! The route was well marked and the rest stops provided abundant goodies; delicious too. The volunteers were all friendly, informative, and approachable. My friends and I will definitely return next year to ride this wonderful cycle event. Thank you for putting on a great ride! Fourth year of this event for me, third for my wife. Stunning scenery, we both very much look forward to this event each year. We do the metric, just right for us old folks. Roads through Pope Valley a little rough, but our bikes handled it well. Great rest stops, wonderful staff and support. Registration and check in very smooth and easy. Post ride BBQ was a little weak this year, but the entertainment was great. Worst part was that they ran out of suds before we got there!! I was so looking forward to a couple IPA’s after, but had to settle for a Sprite, and watch others finish their beers! Rode the 1/2 metric (30+) miles with a group. Beautiful weather, good roads, and helpful staff. The food and drink at the halfway point was excellent, with a wide variety of choices. Very gentle terrain for this given course, with more hills available for other rider abilities. Two thumbs up. Ride is stunning through the hills of Napa. Some of the roads are rather choppy, but most are smooth and pleasant riding. The food at the rest stops and the people volunteering were both great. The t-shirt this year was not my favorite, especially compared to year’s past. Overall this was a fun ride. The Good: The scenery was great, everyone was friendly, and the post ride lunch was great (barbecue chicken, sausages, cole slaw, fruit, ice cream!). The rest stop was well stocked with a good selection of food and beverages, and everyone at the event was EXTREMELY friendly. Could use some work: The road markings were very small, and we actually missed one of the first turns because of that. Also, one of the rest stop signs was misplaced (on the wrong side of the road), so it led us to believe a rest stop was nearby when it was actually about 8 miles further. Some of the roads were bumpy, but that’s not the event’s fault. Great ride and beautiful scenery. Road conditions were marginal, some quite good, others quite poor. No schwag, but a great lunch after the ride. Jerseys and T-shirts available to purchase. well organized, saw the SAG a lot on the road, but never needed them. Course was very well marked and matched the route sheets. Parking was somewhat limited (as stated), but worked out ok. Rest stops were well stocked with a variety of food. Thoroughly enjoyed the ride (and the food). Easy parking to start the day. Well organized. Check in was very easy as well. Great assortment of danishes and pastries to get some carbs to start the ride. The morning was a cool and gray to start. Routes were easily distinguished and the roads easy to ride. First rest stop was 21 miles in. Good first leg. Plenty of water and snacks to keep things going. Volunteers were nice and helpful. Off to the next leg. Ink Grade Road was a challenge. I had only done 3 training rides of 10 miles and an overpass was the extent of my climbing. I labored up and up. I had to stop at one point for about 2 minutes to catch my breath. Made it to the water rest stop and was very happy to hear someone say there’s a small climb and then lots of downhill.The downhill was exhilarating. Feathered the brakes a little. Hitting 45-50 mph can be a little scary on an unfamiliar road. Scenery was beautiful. Weather perfect. Rest stops all well stocked. Watching people in their late 60’s passing me on the hills was humbling. But I knew better than to chase them. I rode at my own pace. The flats of Silverado Trail was a nice way to ride in. Cruise through Yountville and back to the Veteran’s Home. This was a great ride. 62.3 miles. I’ll be back next year and hope to do 100. Most of the schwag was the food and fully stocked rest stops, really rough roads on the back roads, scenery is great as always. PhotoCrazy did a great on the rider photos. Overall it was good, very limited (almost non-existent) bike parking for start/finish, roads, specially country ones are really rough and dangerous for road bikes (some descents are really bumpy and make breaking space very challenging. Traffic support was great with the help of local Police Department. Not much schwag, but that was not why I attended this event. My all time favorite bike rides. Highly recommended. The bike routes are very user friendly. Food and snacks at rest stops are endless, love the hard boiled eggs, and the BBQ for the post meal are always great. My wife and I really enjoyed this event. Even our friends from out of town were very impressed with how the entire event was organized; from the scenic routes, friendliness of staff, CHP presence, food, and entertainment. We will definitely be back in 2018. Thank you ECC for coordinating and hosting this event. By far one of the best centuries I have participated in. The distance between rest stops was perfect, the food and support was excellent. Will do so again next year and recommend to all my riding friends. Well organized. I did the 65 mile ride. The views were amazing. Roads were ok, some roads that need repair. Stations along the way were well stocked with great snacks. Finish line did not exist. Need to have a finish line and better food at the end. Need to have something for finishing, medal, T-shirt, something! Overall, would do it again. Thank you! I really liked the food entree choices and drinks. Also, loved the fresh made cookies that were available at the 40 mile rest stop. So yummy! The support staff was helpful, especially guiding us how to continue the ride after the rest stop. The signage throughout the route was so clearly marked! Great event and ride. So much fun! Excellent food! Homemade cookies along the course. Some bumpy roads, but they’re improving each year. Safe course, staff is very friendly. And free Ben & Jerry’s!! Register early for the best price! Beautiful scenery, great volunteers and well executed. I liked the flexibility for starting time. I was easily able to follow the route markings. The food at the aid stations had a great variety and I liked the sports drink. It did seem the last AS was shutting down early, but I was slow too. The route, although beautiful, was challenging in the 100 miler. And the roads and some fairly rough spots. I thought for the most part we were either on a good bike lane/shoulder or there wasn’t much car traffic to worry about. However, I did have one close call when a truck pulling a boat decided not to move over at all when there was no shoulder. SAG happened along just as I needed help changing a flat. THANKS! I registered fairly last minute so didn’t have a chance to order a tshirt or jersey and nothing was given as part of the cost. My first century and nothing to show for it. I had a great time riding this event. The staff who volunteered are my heroes because without them I wouldn’t have been able to finish this ride. All the food and drinks they provided were essential to completing this ride and everyone was more than happy to help. I cramped up during this event and the SAG support was on top of their game, offering to give me a ride and refill my water. This was a great and organized event that made the 100 miles doable . Cheers! We did the shortest (35 miles) flat ride. About 1/3 of the ride is on nice country roads, but much of the ride is on 50mph, two lane roads, with sometimes very narrow bike lanes. Scenery is very nice, but you have to pay attention to the road more than the surroundings. Support is pretty good, with the right kind of rest-stop food for energy. Lunch was just okay. The event was very well organized. I am a beginning rider, and appreciated the ease and help of the staff. I had doubts about doing the 40 mile route, but I completed it. The CHP escorts definitely added safety to the ride. I enjoyed the rest stops and thought the lunch provided at the end of the ride was nice. I will definitely will consider doing it again next year. Perfect weather, great route (I did the 100 mile), and a world class location! My biggest gripe, and I know this event is run and staffed by wonderful volunteers, many THANKS to you all!!!! !, but the food at the finish was not up to par. My choices were dry BBQ chicken, two watery salad options, and fruit (I had plenty of fruit during the ride…) and no beer, not even for sale! After riding 100+ miles I was looking forward to a cold beer and a tasty meal. With all the wineries, breweries, and restaurants in the area they should’ve been able to get some help/support/donations for the finish – most all those places have donations in their budget! Did they even try to contact and work with any local food/beverage purveyors for their event?! A wonderful ride and THANKS again to all the wonderful volunteers that made it happen! P.S. Great route sheets but the markings/signs should be more prominent. The event was super fun! Did it with my dad and we had a great time; awesome bonding experience for us beginner bikers. Would do the 65 mile ride next time. Ben and Jerry’s ice cream was also a good treat after the ride. Do note the bumpy ride down some of the hills though, but otherwise great scenery and interesting ride! Great weather this year! Scenery is outstanding!!! This ride has excellent support provided by the Eagle Cycling Club as well as the local CHP at major road crossings. Road markings were clear at all intersections such that I did not need to consult the turn by turn directions. All of the rest stops were well supplied with a variety of food options. Photo Crazy took pictures of all riders with about 5 miles remaining. Previously, they had been on a quieter road which worked better. That said, they have a great system in place for taking pictures such that they are easy to find and are great quality. I rode the 65-mile version of the Tour of Napa Valley in August 2017. The weather was lovely for that ride, the scenery is beautiful, and many roads were in good condition. Rest stops were well stocked with good food choices and Cytomax and water. Staff members were friendly and helpful. One road with many potholes led to a tire blowout on a descent for me. My tire sidewall was ruined, but a SAG team member had a spare tire which enabled me to finish the ride. Without that spare, my ride would have been over right at that point, so I was grateful. Lunch after the ride was ample in choices and amounts. A band made things festive and the option to take a shower was wonderful. If you want to take advantage of the showers, remember to bring a change of clothes and a towel. My only real complaint would be the distance from the parking lots to the registration/start-finish/lunch area. It was a very long walk, and riding a bike back and forth has its drawbacks, too. All in all, this is a great ride that I would sign up for again! This event takes place at one of the best time to tour Napa on a bike and enjoy the scenic vineyards. Event hosts are very friendly. The after-ride BBQ and live music is a great way to wrap up the afternoon. Start/Finish is at the historic Yountville Veteran’s Home. Goodies at the start for all riders! A post ride BBQ lunch (vegetarian available) at the end of all rides. Picnic tables and a large grass field for relaxing! sorry no pets,. Hot showers may be available. Pool with lifeguard (small fee). Commemorative patches! – Available pre-order only! T-shirts and Jerseys for sale – Available pre-order only!